“50 Great New England Family Vacations” is the ultimate planning guide for families that enjoy outdoor recreation, hands-on learning opportunities and making wonderful summer memories together. 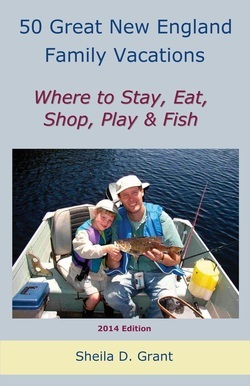 While all 50 chapters do include excellent fishing destinations, Grant also includes a wide range of activities sure to please non-anglers, and to keep the family entertained when the day’s fishing is done. Lodging options range from tenting and RVing to rental cabins, resorts and family-friendly hotels. Chapters include where-to information on hiking, wildlife watching, biking, horseback riding, golf, kayaking, dining, shopping and more. This guide also includes educational opportunities at museums, aquariums and historical sites throughout New England. Be sure to pack “50 Great New England Family Vacations,” -- and a camera -- to capture summer vacation memories that will last a lifetime! Sheila Grant has been a writer/photographer for over a decade. Her work has been recognized by the Maine Press Association and the New England Outdoor Writers Association. Grant is the editor/writer of two national economic development newsletters, the Downtown Idea Exchange and the Downtown Promotion Reporter, as well as a regular contributor to North Country magazine and Bangor Daily News Special Sections. Her work has also appeared in The Boston Globe, Northwoods Sporting Journal, Up North magazine, Bangor Metro magazine, Maine Senior magazine, Game and Fish magazines covering Ohio, New York, Pennsylvania and New England, and at www.OneNewEngland.com. For more about the author, visit www.sdgrant.com or join her Facebook page, S.D. Grant, Freelance Writer.